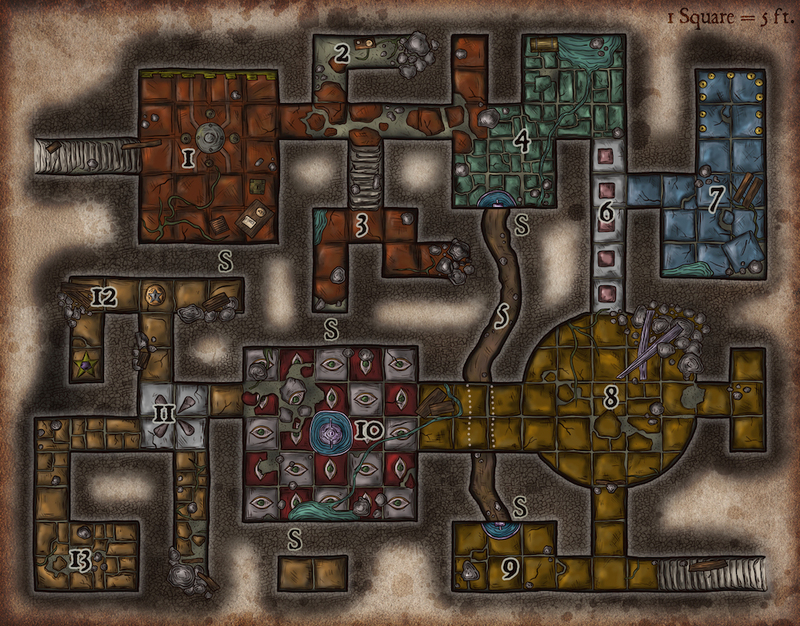 This resource features the general description of an underground dungeon where a treasure is hidden. 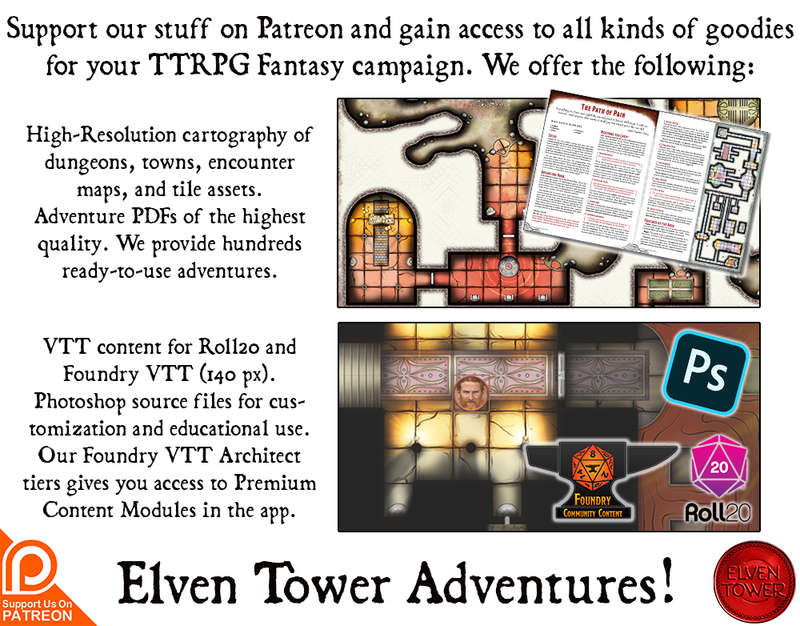 It includes adventure ideas that are appropriate for mid-level (Levels 6 to 10 in Dungeons and Dragons) adventuring parties. No rules info is given in this resource it is adaptable to any system. There is an old legend that mothers tell children in sleepless nights about the brave hunter Saint Danbert. The legend has many variations depending on the culture it is found at, but scholars have documented a few ancient manuscripts about the Gallesian Wars that refer to it. There is a core of truth, after all, behind every tale and legend. During the Gallesian Wars, the old Castle Ransunner was under siege for several months. Castle Ransunner’s allies were far away or caught up in their own affairs. No one was able to help for a long time. The walls were tall, well protected, it had never been stormed before. The attacking commander knew their allies would not come to their rescue, but he also understood how decimating an attempt to attack would be. So he decided to siege them and wait. After months of isolation, food started to dwindle. Sickness and hunger became the real enemies for the people inside Ransunner. A few low-borns found themselves in the middle of the fray after fleeing for the safety behind the castle walls. Little did the knew they would spend months trapped. One of them was Danbert; a man of low status, hunter by profession. During the worst of their hunger behind the siege, Danbert decided to brave fate and got out of the castle stealthily with a few other fearless men. Under a shroud of darkness, they bypassed the enemy scouts and entered the forest. They hunted deer, boar, rabbit or whatever moved and safely returned to Castle Ransunner before dawn. It was a small meal when given to the garrison, but always better than rats or cats. Danbert managed to pull the same heist two more times before allied forced eventually showed up and broke the siege. It was later revealed that the kingdom’s prince was masquerading as a farmer the whole time inside the castle. The prince mentioned the story to his father, the king, when they were reunited. The king, a very religious person, thanked Danbert personally and appointed him to be beatified. The king was an old man and Danbert saved his only son, securing the line of succession and the future of the kingdom. Saint Danbert found himself in a position no hunter would ever dream of. And he disliked his new status of sanctity, having his own ideas of religion. He received a small fortune that he chose to hide. Danbert knew of an old underground dungeon. No one who knew about it had a clue what it was built for. Danbert decided to hide the gold there. Later on in life, when people had already forgotten of his newly acquired status, he would use the gold to purchase a big farm and live the rest of his days. Unfortunately, this never happened, a terrible plague scoured the land a decade later and Danbert died. The dungeon’s entrance can be found near Castle Ransunner, east of the great forest. The dungeon features two different entrances. Adventurers may be able to find them both if they explore the area thoroughly. Some passages of the dungeon caved in after centuries of abandonment. Those halls are completely obstructed, blocking the access to other areas. The gold is hidden in Area 10, inside a secret compartment in the fountain. A stone key is needed to open this compartment, the key is hidden in the chest in Area 4. All areas in the dungeon show signs of severe erosion, age, and structural damage. The place must be a several centuries old, at least. Saint Danbert has been dead for more than five hundred years. Since his status as “Saint” was only a royal decree and never ratified by the church, his story was forgotten with time, becoming a legend. There are no entries about a “Saint Danbert” in any churches’ records. But the adventurers might find the information they need if they research the kingdom’s archives for royal decrees. Area 1.- The north wall of this room features twenty-one niches. Some of them are open and empty, the ones that are close still contain the bodily remains of long-dead people. The place is protected by four creatures of darkness. Restless spirits that refuse to leave their decaying bones. There is a small table near the south wall. The jar on the table is full of lamp oil. The wooden boxes have pepper and oil inside. These things were placed here not long ago. A secret door hidden in the south wall opens to Area 12 after a short descending passageway. Area 2.- The passage collapsed a long time ago. A swarm of venomous spiders hides between the rocks and under a small table. The body of a dead person lies next to the table. From the level of decomposition, it has been there for a few months. Area 3. After a short flight of stairs, the way divides. The passage to the east is collapsed and impassable. The one on the right seemingly ends in a dead end. There is a secret door to Area 10 that activates when pulling a fake brick. Area 4.- Water from recent rain filters through the soil and accumulates near the north wall of this chamber. The water is clear. The marble fountain on the south wall is decorated with runes and symbols. The symbols mean old names for known gods; it is a holy water pile, though the water is no longer holy. On the top of the mountain is a figurine of a beautiful female maiden. Pulling the maiden figurine activates a mechanism that slides the fountain the left, revealing a secret passage. The chest near the pond is empty except for a strange stone statuette. The statuette is the key for the fountain in Area 10. Should a person come inside this chamber without a holy symbol in sight, the demonic soul of a deceased priest attacks them. The entity is formidably powerful. Even if defeated, its essence is reformed after a week. Area 5.- The secret passage goes south in a descending slope to Area 9. It connects the two holy water piles. Two monstrous centipedes await burrowed under the raw soil. They are motionless and attack only when their prey is directly on top of them. Area 6.- This passage slopes downward slightly to Area 8. The mosaics feature a pink colored square in each of them. All of them are buttons that activate arrow traps. The arrow holes are on the ceiling of the hallway. If any of the buttons are pressed, arrows rain in the hallway. Area 7.- This chamber features a pong of rainwater that filtered into the dungeon next to the south wall. Surrounding the north wall of this chamber is an assortment of vases arranged in a semicircular manner. The vases contain the organs and other body remains of a ruler from ages past. A great number of black beetles roam the walls of this room. If any of the vases is disturbed, all of their covers open at once and clouds of sand erupt from them. The sand coalesces and takes on the undead form of the undead king. The mummy attacks the adventurers at once. Area 8.- This round chamber is partially collapsed. Past visitors and tomb robbers are in this room. They are now dead, guarding this place for eternity. They crave to add more members to their lonely eternal club. The undead men attack anything that moves but do not leave this chamber. Area 9.- This small chamber near the alternate entry to the dungeon features a holy water pile identical to the one in Area 4. It opens in the same way. The water is not holy. Area 10.- The room features a checkered mosaic pattern on the floor. Each mosaic is decorated with the effigy of an eye. The room is hypnotizing. A magical aura makes any visitor feel like all eyes are staring at them. Three of the eye mosaics are pressure plates that activate deadly traps. If any of those mosaics is pressed, a column of fire erupts from the eye, burning anyone directly on it. A pile of burnt bones rests near the fountain. The ghost of Saint Danbert haunts this chamber. He found insanity in immortal life. The ghost is aggressive and seeks to guard the treasure. If destroyed, the ghost reforms at dawn. The only way to put the ghost to rest is to use the treasure to buy a farm and gift it to Danbert’s last descendant. The marble fountain features an opening in its base where the key in Area 4 fits. Once the key is placed, a section of the fountain moves to the side revealing a narrow hole. 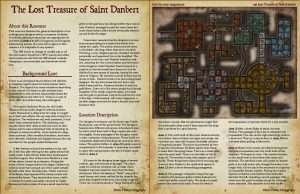 Down the hole is a secret chamber where the lost treasure of Saint Danbert still remains. Area 11.- The intersection between several hallways is protected with explosive runes painted on the floor. They have not been activated because no visitor to the dungeon has ever gotten this far. Area 12.- This wall features two mosaics with decorative stars on them. Both of them are pressure plates. If a person stands on them they move down a little causing sound of machinery working behind the walls. There does not appear to be any effect other than that. Whatever their function was once, they are broken now. Area 13.- This dead end contains the broken, rotted remains of some pieces of furniture. From the type of furniture, it appears that this room was a type of office or sentry post.